Company is a potential sale/take over candidate. The CEO and all execs are over 70. They pay high taxes. Others in the industry have been bought up. Business is good. The most recent 10K shows annual EPS growth of 50% from the prior year. The number of shares outstanding hasn't changed since at least 2002. Poor use of working capital. Growing inventory and decreasing inventory turn. There are a few things to note about this backlog increase. This is the first time they've filed the annual report as an 8-K, they usually just scan it in. And, at least in the past 10 years, this is the first time they've specifically mentioned a number when discussing the backlog. Usually they just say something like "the backlog remains strong” as they did in 2011, 2010, 2009. In 2013 they said “our backlog shows substantial growth” as it had grown 10%. Now they say “The backlog has now grown to a record level of almost $8,000,000.” The last time they said something like that was 2007, “…our backlog, which was approximately $2,864,000 at March 30, 2007 has increased more in the current first quarter to an historically high number.” And after that, from 2007 to 2011, the backlog grew by 90% while revenue grew by 120%. "Although we’ve referred to the backlog anecdotally in past President’s Letters, in our 2014 report we mentioned the dollar amount, to further substantiate our successes. This growth has been steady, and is due to our success in cultivating our current customer base as well as acquiring new customers. This growth continues." I would rather the company tell me specifically what orders or circumstances led to the backlog increase but there is some information we can take from their comments and this whole situation. I'd say it's unlikely that the backlog has a seasonal upswing in Sept that they highlighted with this 8-K, on the contrary I agree with the company's tone: they are experiencing a jump in their already present growth and are showcasing that. 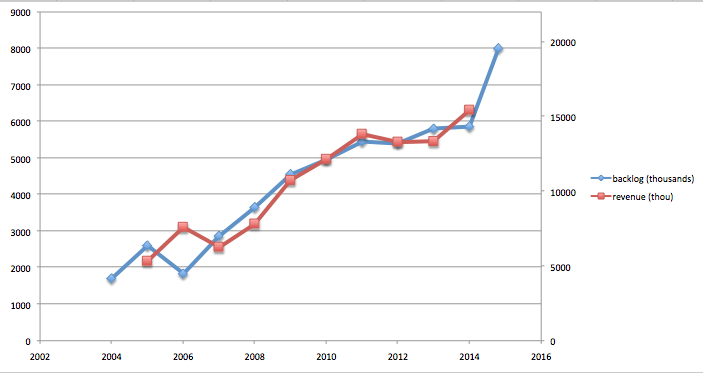 You may be concerned that this could be a one time jump that will fall back down but to oppose that I would say look at how well the backlog and revenue have grown over the past 10 years. This company does not put out PR just to bump up share price. So here we have a backlog that has shown very strong growth. We have strong past correlation of revenue growth with backlog growth. And we have a company telling us the new growth is not a one time deal and in fact continues on. The company uses short term financing secured by their accounts receivable and inventory which they refer to as the "Factor." I think they used to need it more than they do now and you can see that with the following two graphs which show the excess payments made in recent 10-Ks and 10-Qs to the Factor. You can see they needed the Factor for sure prior to 2010 and then again in 2012 but they don't right now. They have only owed money at quarter's end in 1 of the past 20 quarters, though they have been close on a few other occasions. The main thing I take from this information on Factor payments is what I also take from the backlog and revenue graphs: the company is growing. They have transitioned from needing outside short term financing to not. Additionally the company is more stable than in the past, just look at the most recent 6 quarters of Factor payments relative to the 6 prior to that. You can also see a 4 year cycle in the 10-K excess payments graph which may point to needing it more next year but with the backlog increase perhaps the cycle will be broken. "We will continue our access to asset-based financing based on the strong urging of several board members and others in the business community, who advise that it is always desirable to maintain a banking source of funds. While you are correct that at this ‘snapshot’ in time we could provide internally all needed working capital and fund our present plans for product and staff development, ignoring the possibility of future stressful times during which outside financial support would be valuable is not prudent. Further, we have researched alternative depositories which would provide meaningful low risk short term returns for excess cash and find there are no viable instruments in today’s markets." One negative pointed out in the above linked prior write ups is customer concentration. I agree there is some risk here and it's not ideal but I don't think it's much to get worried about. First it's a common issue with microcaps so if you're reading this I think it's likely you are comfortable with this sort of situation. Second the company has done very well in its history with this situation. 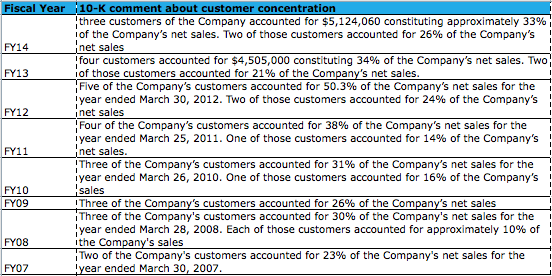 Below are the comments made in the past eight 10-Ks about customer concentration. Percentage-wise the concentration is in the same place so the big customer orders have grown alongside the overall company growth. They have always had few customers whom each constitute about 10% of their total revenue. This may not be ideal but the situation is stable and could certainly be a lot worse. The other concentration the company has is military and that situation has been improving continuously. Going back 10 years the company derived 75% of their sales from the US Military. In the most recent 10-K that dependency has dropped to 58%. The diversification has been steady. There appears to be a one year lag from backlog to revenue in the above 10-K Revenue and Backlog graph. If that trend continues, and if the backlog reported in Sept 2014 is reiterated in the 10-K in July 2015, then FY15 revenue will be about flat while FY16 will show a big increase. The 8-K containing the backlog increase was filed in Sept 2014. Q2 ended in Sept and was filed 2 months later. Q3 ended at the end of Dec 2014 so it's the first full quarter of operating since the company announced the backlog increase. I don't now when the backlog increase actually happened or how quickly it can influence results but there are a couple of data points from Q3 that indicate a noticeable increase in results. First we had a 21% sequential quarterly revenue increase (29% YOY). Concurrently we had a 41% sequential quarterly increase in EPS (212% YOY). See the graph below. This is not the fist time the company has had a big quarterly revenue growth but it's a good sign. Is this big jump in revenue and earnings due to the backlog increase or just a coincidence? I don't know, but if this is the flat FY15 then I can't wait to see the big FY16. Second we had a 14% sequential quarterly increase in raw good inventory. There are a few points to make on the inventory. One thing you may notice when going through IEHC's filings is in every 10-Q all 3 components of inventory (raw goods, works in progress, finished goods) change by the same amount. I asked the company about this and it is because they do an annual check on inventory and in between simply modify all 3 by whatever amount the raw materials has changed. Generally an increase in raw materials is a good thing as it indicates increased orders to be filled but the graph below and this company's history with inventory does not really agree with that. You can see a big increase in raw material inventory at the end of 2010 that actually preceded a drop in revenue. So maybe this increase in raw materials is a good thing or maybe it means nothing. At this point I think it's useful to take a quick look at EPS. The graphs below show quarterly and TTM EPS. There does not look to be much seasonality in the business but it certain is jumpy. Again the overall trend is growth. They often repeat the same thing year after year and/or quarter after quarter. I don't think this is necessarily good or bad but keep it in mind as you read through IEHC filings. For the past few years they have said "The circular product line of connectors introduced several years ago for the medical industry continues to be very rewarding for the Company. The line has been expanded to include connector cable assemblies utilizing the circular connectors." and "A new product line featuring high density connectors has been added to the Company’s product offering." They also frequently state the following: "In order to remain competitive, the Company has an internal program to upgrade and maintain machinery (to increase production), review material costs and increase labor force productivity." "This new product line is in place, and we are expanding on it. It has not yet had a material effect on our inventory." "While buybacks and/or dividends are always under consideration, current capital is being employed in new equipment and resources, for the purposes of increasing capacity to meet customer demands, and to new product development, to expand our offerings." I recommend reading the Whopper Investments and OTC Adventures write ups on IEHC for a background on these subjects. I don't have much to add other than to say that one may lead to another. That is to say that if the company were sold the new owners would have the freedom to modify working capital as they see fit to increase cash flow or whatever they want. It seems to me that IEHC does not feel their use of working capital is a problem. They have been moving in the same direction for years and when I asked about reducing inventory they said that's not what they want to do at this time. Overall I think we have a company that has been growing nicely which has accelerated that growth in the past year with a huge backlog increase. The company is not the best at handling their working capital or turning profits into cash flow. With the CEO, owning 40% of the company, now at age 74 there could certainly be a sale in the near future. The company has been steadily decreasing their dependence on the U.S. Military and that looks to be continuing. At the recent price of $6 per share we have a PE ratio of 8. I don't see a catastrophic worst case scenario. The most realistic negative I see is if the backlog increase turns out to be a singular anomaly. Maybe it was a huge one time sale. In this case the company would fall back into their previous growth. TTM EPS before the most recent quarter was $0.54 so we would have a PE of 11. Another bad case may be if the military cuts spending by say 30%. I don't know how likely an across the board cut is but it's possible. Keep in mind the company has no single customer accounting for more than about 10% of sales so their military sales much be spread across a few branches. I feel like this case is also unlikely due to the type of product we have here, this is not the type of product that is tied to a single program like say some jet fighter. These connectors can be used in anything and everything. This would drop annual revenue down to more like $13M and when the company had revenue in this range they were making an annual EPS around $0.45 which would give a PE of 13. The best case (forgetting about a change of control) would be this backlog increase continuing. Perhaps the backlog increase was the beginning of a big wave. The backlog increased by 36% and we know that the backlog and revenue correlate well together so let's say revenue also increases by 36%. The most recent 10-K had $15.4M revenue so our new revenue would become $20.9M. If we apply the most recent 10-K's net income margin of 9.4% then we get net income of $1.9M, annual EPS of $0.82, and a forward PE of 7. If we instead use the most recent quarterly net income margin of 12.6% then we get annual EPS of $1.09 and a PE of 6. In reality the margins may be better but you get the idea. The chart below gives you annual revenue and backlog growth. Again you can see hints of a delay from backlog growth to revenue growth. Average annual revenue growth over the past 10 years is 13.5%. So here are some valuation scenarios. We have a TTM EPS of $0.72, EPS in the most recent 10-K came in at $0.63, and avg over the past 3 10-Ks is $0.50. Without the backlog growth I would put a value of around $8. Given the recent backlog growth I'd say it's closer to $9 or $10. This is one stock I feel could have a rapidly changing value as the next year unfolds.